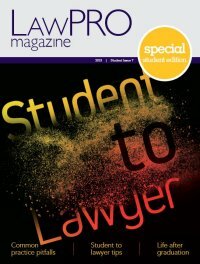 LAWPRO defends actions against lawyers and licensed paralegals practising in every area of the law. In our February issue, we highlighted 2017 civil litigation claims. A plaintiff hired a lawyer to handle certain financial matters, including the drafting of a prenuptial agreement, in preparation for her upcoming marriage. It eventually came to light that her new husband was not the person he held himself out to be; in fact, he was a convicted fraudster, and had convinced the plaintiff to transfer significant money (including the proceeds from the sale of her house) to him. The plaintiff sued the lawyer along with other defendants, alleging that they had a duty to protect her from her spouse’s wrongdoing. With regard to the lawyer, the plaintiff alleged that a background check before the marriage might have disclosed that the husband was a convicted fraudster. In granting the lawyer summary judgment, the court accepted LAWPRO counsel’s argument that the lawyer could not have been expected to investigate the background of a client’s future spouse without instructions to do so. Furthermore, the plaintiff had paid out almost all of her money to the fraudster before the lawyer was retained. In another case (2017 ONCA 931, allowing appeal from 2017 ONSC 3188), this one dealing with child custody, the Court of Appeal held that ineffective assistance of counsel as a ground of appeal is not a springboard from which an appellate court engages in a retrospective analysis of every aspect of a lawyer’s conduct. This is more properly done via a civil negligence action or a Law Society disciplinary investigation.2 The solicitor had represented her client at an Ontario Court of Justice proceeding, where the client lost custody of her daughter. She also represented the client for a further six month period, during which time they launched an appeal of the custody decision. The mother then retained new counsel. The Superior Court judge who heard the appeal ordered costs against the solicitor because of her “ineffective assistance” to her client. The Court of Appeal set aside this costs order. A women’s fitness business brought an action against its former lawyer. The business became insolvent and hired as its lawyer the spouse of an employee. As part of a reorganization, the lawyer arranged for the sale of the business’s assets to another fitness company. The solicitor also gave loans and guarantees personally to the business to permit it to rent new premises. One of the business’s two principals (a pair of sisters) later sued the lawyer, his wife, and his firm, alleging conversion of the business’s assets. In dismissing the action, Perell, J. found that while the lawyer had a fiduciary relationship with the business, he did not take advantage of his position or profit at its expense. The sale of assets was better than could have been achieved by an agreement with a third-party. This litigation merely proved the old adages that no good deed goes unpunished, that a cobbler’s children have no shoes, and go slow and you’ll get there faster. Finally, in the continuing saga of a large-value lawsuit against a law firm based on alleged conflict of interest in advising two sets of differently-placed car dealership franchisees, the Ontario Court of Appeal reduced the amount of the judgment against the firm from $45 million to $38 million, but otherwise affirmed the trial judgment, which arose from the lawyers’ failure to protect the interests of certain franchisees (2017 ONCA 544, allowing in part appeal from 2015 ONSC 3824). In a case based on allegations of negligent legal advice with respect to the creation of a family trust, the Superior Court of Justice granted the plaintiffs partial summary judgment against a law firm, finding that its admitted negligence caused the plaintiffs’ loss. Outstanding issues of breach of fiduciary duty and the determination of damages would be decided at a later trial, as would the firm’s third-party claim against accountants involved in the transaction. A lawyer unsuccessfully sought summary dismissal of a mortgage lender’s claim against him. The lawyer had provided independent legal advice to the putative borrower, and signed a certificate of ILA accordingly. The mortgagor was an imposter. The lender had no solicitor. The plaintiff’s expert, Reuben Rosenblatt Q.C. stated that reviewing a driver’s licence is not enough in these circumstances. Additional inquiries should have been made to confirm that the individual in question was actually the owner of the property. The judgment does not say what these additional inquiries should have been (2017 ONSC 3384 PDF copies are available from [email protected]). In our February issue, we reported on a case about a law firm that obtained, by summary judgment, an order for payment of its legal fees in the amount of $182,569.63 and an order dismissing a former client’s counterclaim alleging negligence against it. That case has since been overturned on appeal10 and the counterclaim has been ordered to go to trial. In overturning the lower court decision, the Court of Appeal disagreed with the motions court finding that the plaintiffs had been made aware of the value of the damages available and the risks and costs of litigation. The cost of defending actions brought by unrepresented plaintiffs is vastly out of proportion to the value of these claims. LAWPRO recently obtained summary dismissal of an unrepresented plaintiff’s action against three solicitors, but at a cost approaching $250,000. LAWPRO counsel was successful in having a claimant declared a vexatious litigant on the basis of s. 140(1)(b) of the Courts of Justice Act. Section 140(1) (b) allows for the designation “vexatious litigant” even though the litigant conducted only ONE claim in a vexatious manner. 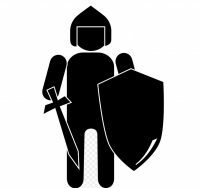 LAWPRO is called upon to defend claims in a wide variety of practice contexts. Current concerns are the lack of predictability with summary judgment applications, and the costs associated with a large number of unrepresented claimants.